One of my very favorite sources for inspiration is Pottery Barn and not long ago I ran across an amazing arrow jewelry holder in their catalog. 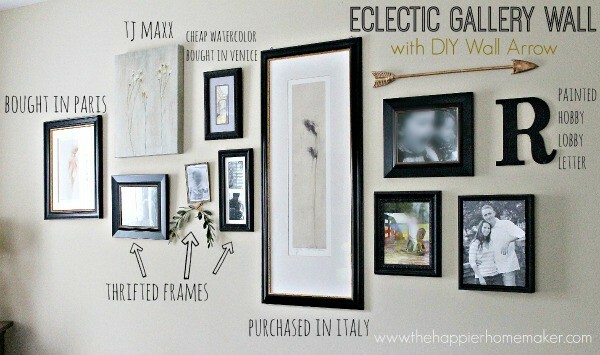 I adored the way it looked styled with a gallery wall and decided to make my own (non jewelry holding) version for my living room gallery wall. To start I trimmed my wooden dowel to 19″. 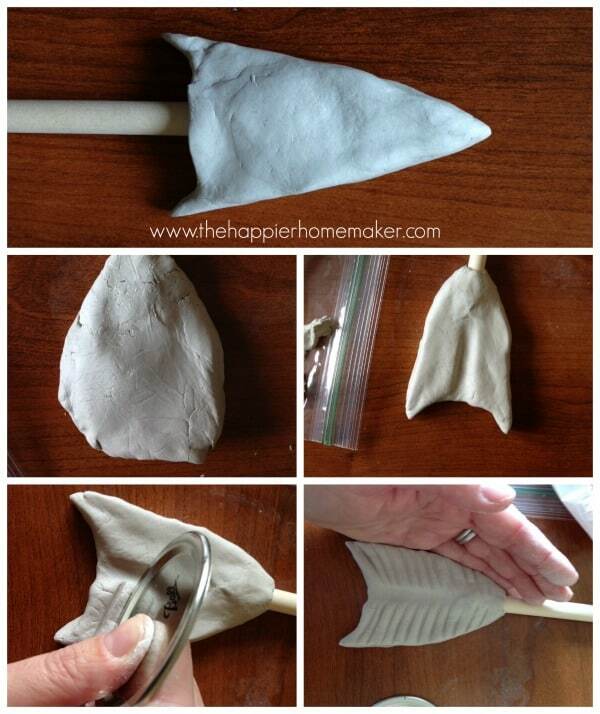 I used the modeling clay to form my arrow head and tail first forming the rough shape, then wetting my finger with a small amount of water to help me smooth the surface. I also formed each piece over the end of the dowel so that there would be an indentation on the backside to attach it later. To make the lines on the arrow tail I used a piece of a mason jar lid (since I have tons of those laying around my craft room!) but you could use any thin hard surface. Once I was happy with my clay pieces I let them sit for 48 hours to dry completely-you will see them turn lighter as they dry and harden. 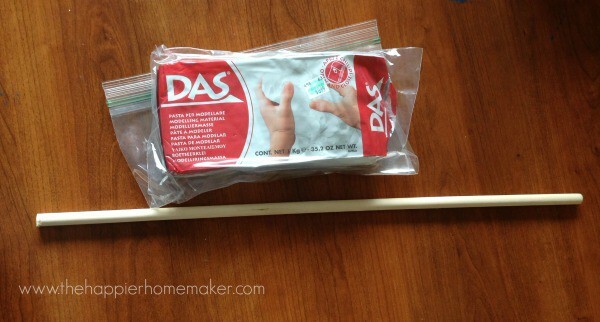 Once the clay was totally dry I used superglue to attach the ends to the dowel. Then came the fun part: painting! 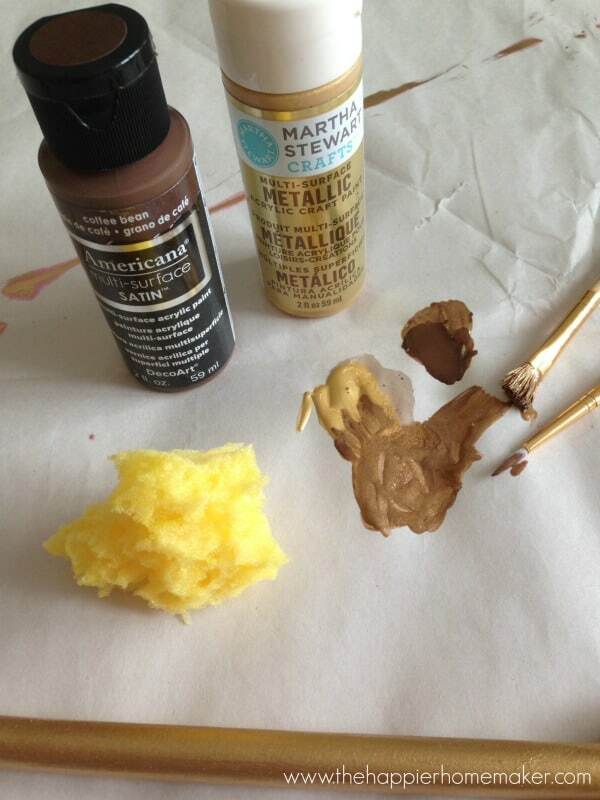 I love Martha Stewart Liquid Gilding and used it as my base coat for the arrow. 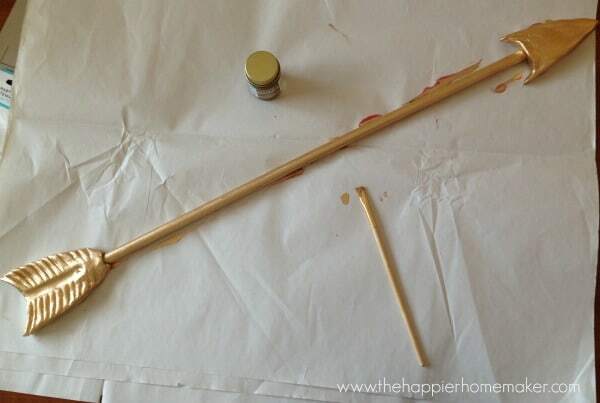 To distress the finish I mixed gold and brown craft paint and sponged it over the surface of the arrow, also using a small paintbrush to get it in the indentations of the arrow tail for added dimension. 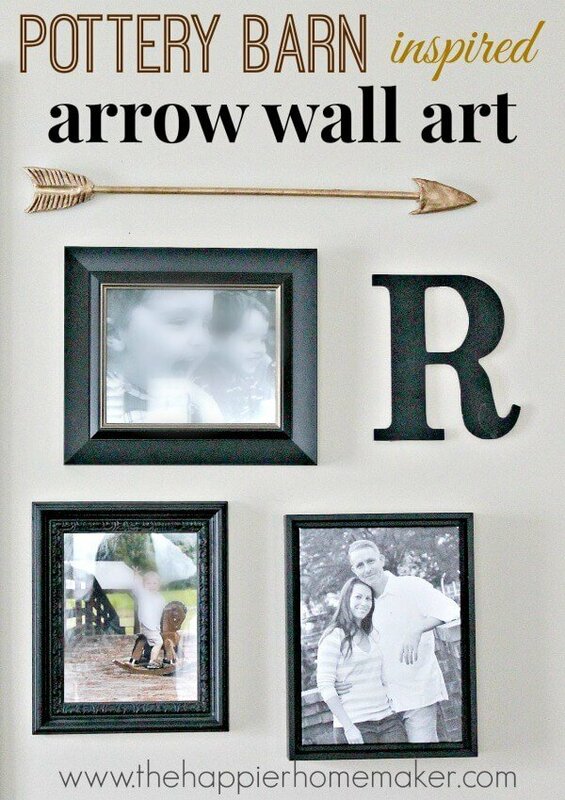 I absolutely love the way the arrow turned out and it’s the perfect addition to my living room gallery wall! Speaking of the gallery wall, Karianne over at Thistlewood Farm mentioned to me a while back that I had never really shared it with you all so I thought I would today. Our gallery wall is a combination of family photos (I blur my kid’s pictures online as you can see, but take my word for it-they are very cute!) mixed with artwork that my husband and I have collected when we lived overseas years ago and a few random items thrown in for good measure. Most of the frames are thrifted pieces we’ve painted to match each other and I randomly hung an olive branch up there at Christmastime and it grew on me so I have left it up as well. I love how all the different pieces work together! By the way, I’m totally aware that my comment boxes aren’t showing up right now on my posts and I’m so sorry! My redesign last week left me with a few things wonky and I haven’t been able to figure it out on my own. I’m on the queue for tech help but it may not get fixed until next week. In the meantime if you need to get in touch you can do so on my contact me page or Facebook and Twitter for a faster response time! I’ll be back tomorrow with a fun Silhouette tutorial and coupon code for you, be sure to sign up for the newsletter at the top of the site so you don’t miss a beat! Very creative! Your wall gallery look wonderful, and your arrow turned out really nice. You did a great job making it. 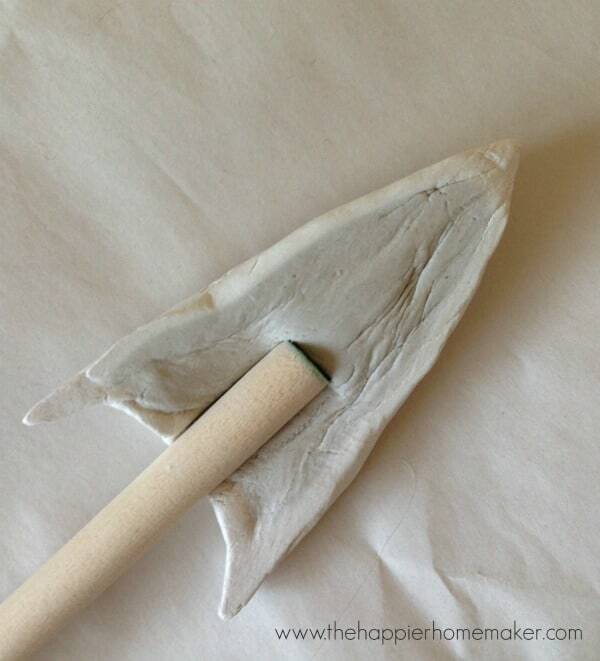 Thank you for the inspiration, and for sharing how to make your arrow. Thanks so much Linda, I was happy with the way it turned out! Have a great end to your week! That is awesome! I’ve been looking for something to add a little character to our photo wall, and I think I just found it! So cute, love this idea. Saw your post from the link party palooza! I’m loving the golden arrow! A great addition to a gallery wall. I adore this! How did you hang it on the wall? Hi Hayley! I used command strips (I’m a bit addicted to them!) I just used the double side sticky strip itself to stick it to the wall, no hooks or anything-it held up great!